Camcorder may not a trendy items anymore today because the function has been replaced by the rising popularity of smartphones which continuously offering better cameras for casual users. However, it doesn’t mean that the unit is completely irrelevant anymore because camcorders still offers better capabilities than your regular smartphones cameras. Two popular camcorder you can opt to in the market now are Panasonic HC WXF991K vs Sony AX10. These two has similar capabilities yet also different. If you are confused about which to choose, check our article below. Along with the popularity of 4K quality videos and content promoted by the currently popular 4K TV, it seems that camcorder also don’t want to be left behind by also offering the capability to record footage in that eye-catching quality. Among a numerous similar camcorders in the market, Panasonic HC WXF991K is a great option if you want to record a high quality footages which has four times the pixels and four times the clarity of 1080p video in a compact consumer camera. From the outside, this camcorder looks just like any other similar cameras but if you look closely into the LCD panel, you will notice that it has something unusual there, yes it has another camera. It may be weird to have additional camera here and it makes us wonders what it is exactly for. There are actually some possible use cases here and the first being for a home video when you want to shoot everyone including the operator. The second option is for prank video or similar content that offer behind-the-scene experience for the viewer. The last possible use is for video blogger who want to film themselves while talking or performing something. When activated, this camera will make your video has another picture inside and it can’t be removed from the result in post-production editing unless it is cropped out. Read also: Sony FDRAX53 B vs. Panasonic HC WXF991K here. 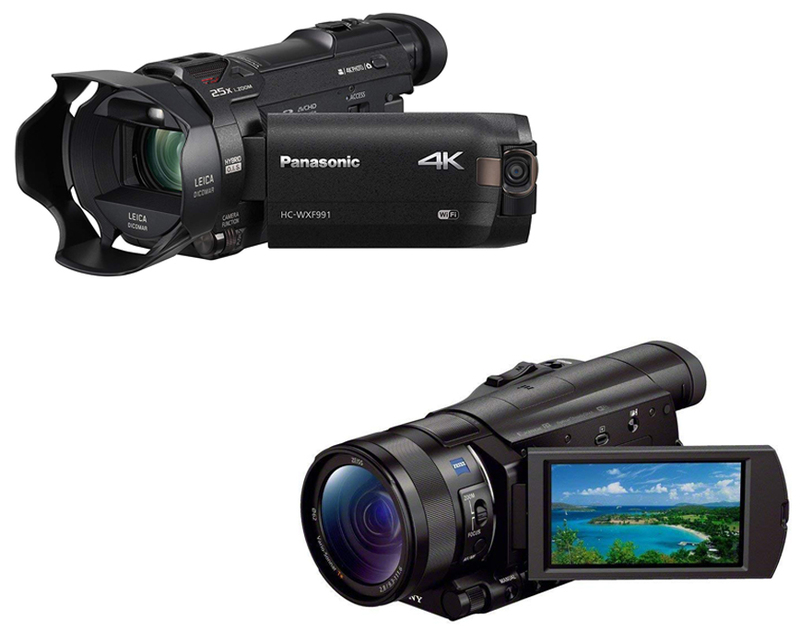 Since the Panasonic HC WXF991K is the upgraded version of the WX970, these two camcorders seem to have a similar features but of course since the first is released latter, it also comes with an upgrade. In this case, it is the electronic viewfinder which makes the unit also a bit heavier and makes it sit in between casual users and professional alike. It is sporting a 0.24-inch electronic viewfinder with an ability to be adjusted in different angles. As a camcorder mainly marketed for casual users, there are a bunch of mini features designed to allow you with less experience to produce a cinema like effects which are usually will take some more efforts if done in professional device. For example the dolly zoom to replicate that Vertigo effects you can find in many big movies and TV shows. For those who would like to record fast moving objects, there are slow or quick motion function which is especially useful for sport scenes. 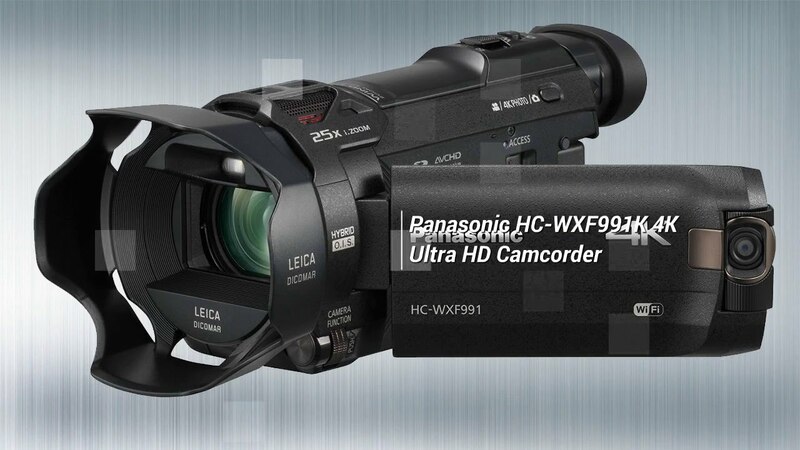 The Panasonic HC WXF991K is using LEICA Dicomar Lens with optical 20x zoom and intelligent zoo up to 25x for the 4K video and 40x for HD video. For those who use camcorder off the tripod, there is a 5-axis hybrid optical image stabilization here. Sensor is 1 /2.3-inch BSI MOS with effective pixels at 8.29 MP. If you think that all the features and offerings in WXF991K is still not enough for you and you need to find another more powerful camcorder, you may want to take a look at Sony AX100. Sony has been making a lot of handy cam since decades ago and the company continue to upgrade their products to follow the technology advances which is why now their camera also offering the ability to record video in 4K quality. Making the product as a prosumer unit, it is sporting a bigger sensor than many other its competitors out there. 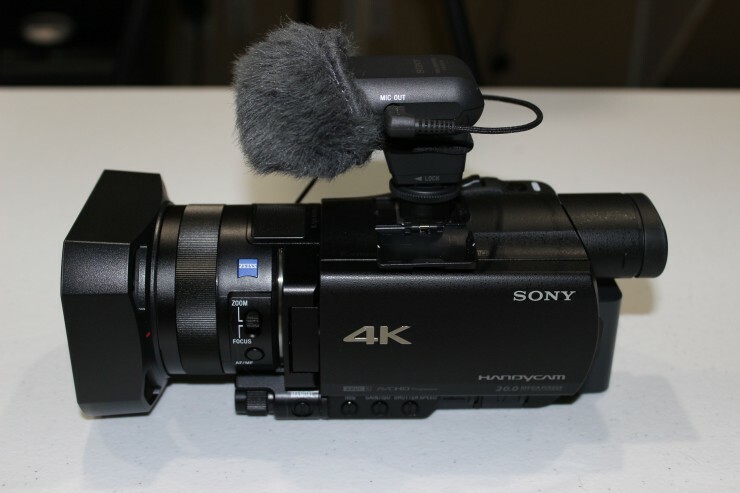 As a camcorder, the Sony AX100 is compact enough to be handled comfortably with one hand and the high quality finishes give the unit a professional vibe. Even though we say that this is a compact camcorder, it is still not small enough to be fitted in your pocket. The lens hood and cover on the front are solid and can be easily removed whenever you want. When tested, the build-in strap is comfortable for operating the camera such as taking photos, starting, and stopping the recording. As it has been mentioned earlier, the Sony AX100 is coming with a big sensor which is the 1-inch type, similar like those in recently released mirrorless cameras you can find in the market. Thanks to the bigger sensor, the camcorder has an improved performance under low-light condition and you may also add gain when there is not enough light to properly expose the object you want to capture. However, adding gain also means adding more noise but the level is still acceptable. The aforementioned sensor is combined with the Zeiss lens to produce a sharp and full vibrant pictures while the big sensor is helping out with the depth of field when used at the lesser f-stop values of the lens. This lens will allow you to do 12x optical zoom controlled by its variable rocker in the grip while the clear image zoom will let you do up to 18x for 4K video and 24x for HD video. BIONZ X image processing also allow the camcorder to record more lifelike images and faster processing. One of the best thing in this camcorder is the manual adjustment controls that will allow you to adjust the gain, shutter speed, and iris individually. Audio is capture using the 5.1 channel surround microphone with its several manual which is usually only available in higher-end camcorders. Now, let’s compare Panasonic HC WXF991K with Sony AX100. As you may already know, the basic difference between them is the fact that AX100 is using a bigger sensor than the other to give a better depth of field. At the other hand, even though with smaller sensor, HC WXF991K is able to perform more zoom than Sony even though Sony also have more effective pixels. Another difference is the additional camera in HC WXF991K which is useful in case you want to include the operator into the main video. All in all, the decision is all yours to make. In our opinion, both of them are good option for 4K quality recording. However, if you don’t mind about the price gap, we will recommend you Sony AX100 because of the larger sensor and more effective pixels.